It’s really just Red Bull KTM’s world right now, and we’re just living in it. 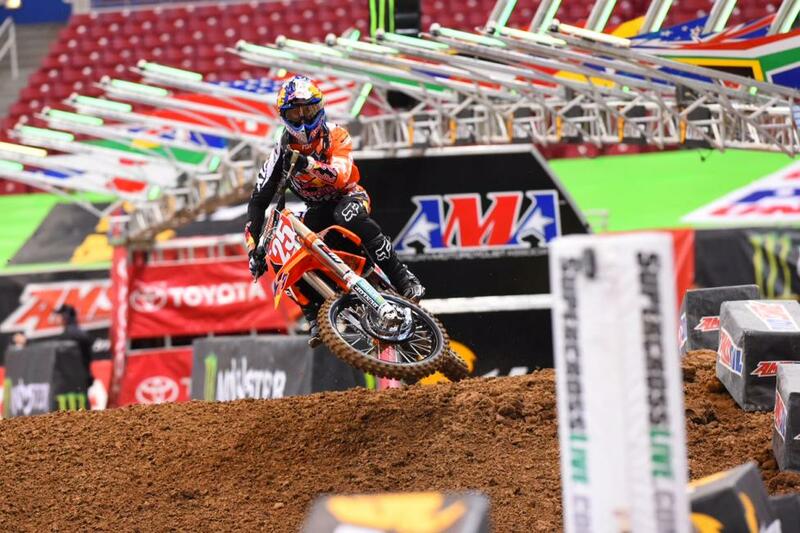 In St. Louis, Ryan Dungey and Marvin Musquin didn’t just score their fifth “double” by winning both the 450SX and 250SX classes, respectively, but they also won their heats and logged the fastest times in qualifying. For good measure, Andrew Short delivered a heat race win on his BTOSports.com KTM. Hey, the first turn of the 450SX main featured three KTMs (Short, Dungey, Short’s teammate Justin Brayton) and their sister brand in Husqvarna, with Jason Anderson, in fourth. It’s really quite remarkable. 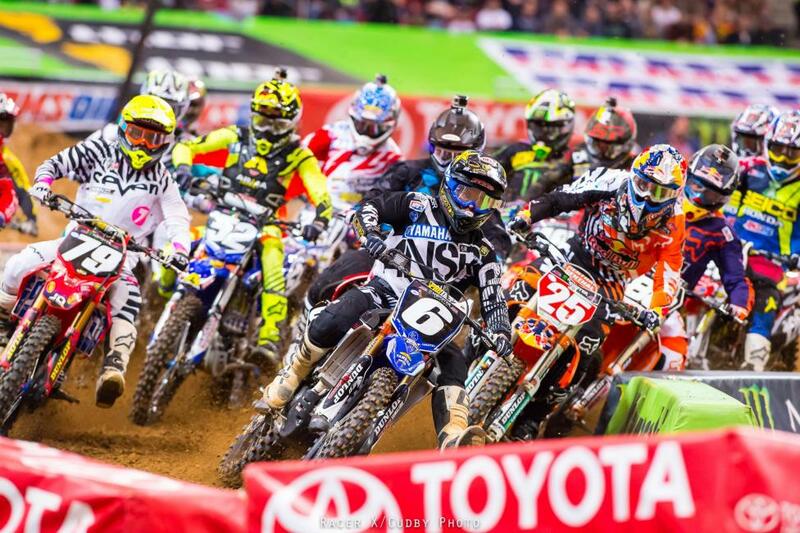 Dungey was untouchable on this night. It looked to be Eli Tomac’s day early in practice as he logged the fastest times, but Dungey showed up sharper for the final session and ended up with the fastest overall qualifying time. Once he gated well in the main, you knew it was over, and he basically didn’t put a wheel wrong for the twenty laps. 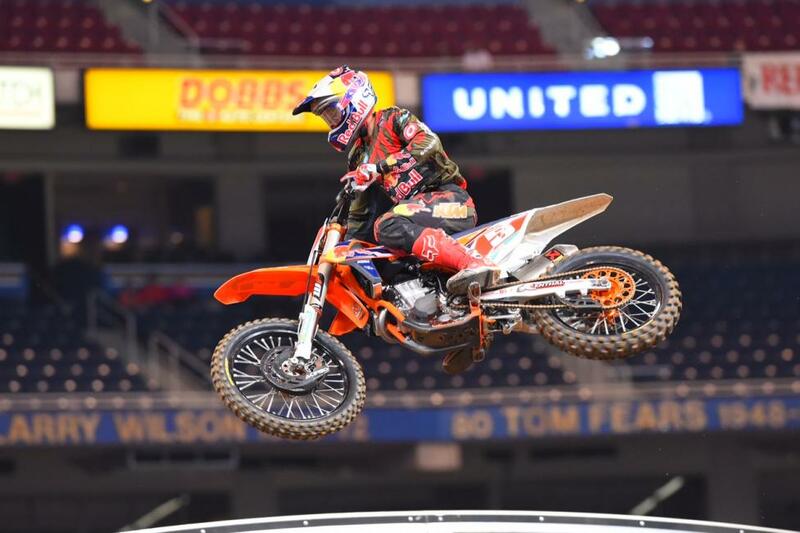 That’s six main event wins for Dungey this year. Short’s night ended quickly after that holeshot, as he went flying sideways off the face of a jump, went off the track, and bashed his bike up too much to continue. Andrew was okay. He told us he wasn’t sure what happened, we suspect it might have been a bike problem that sent him down in the first place, and then ended his race. With Dungey long gone, the best action was a four-ride battle that materialized between Weston Peick, on the Autotrader.com/Toyota JGR Yamaha, Anderson, on the Rockstar Energy Racing Husqvarna, and Honda men Eli Tomac (GEICO Honda) and Cole Seely (Honda HRC). 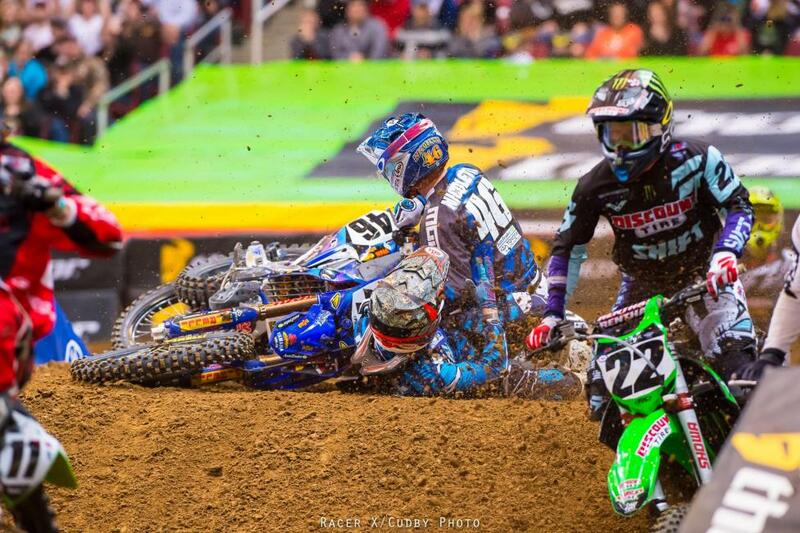 Peick was second for awhile after Short crashed out, Anderson made the move on him. Then Tomac came rumbling through after a so-so start, he ended up passing Anderson, then missing a triple, and Anderson got him back. Took Tomac a few laps to regroup but he came back after Anderson and got him for second. Tomac had an ace up his sleeve with a big quad jump he had tried in practice, then revived for the main. 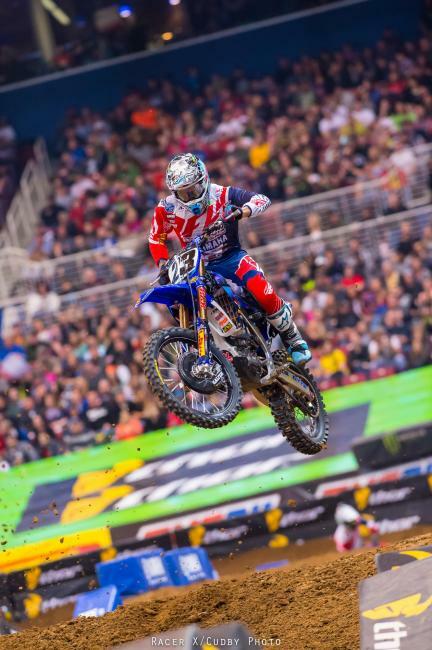 It made the difference as he jumped past Anderson and Peick—not unlike the way he got Dungey for the lead last week in Detroit. 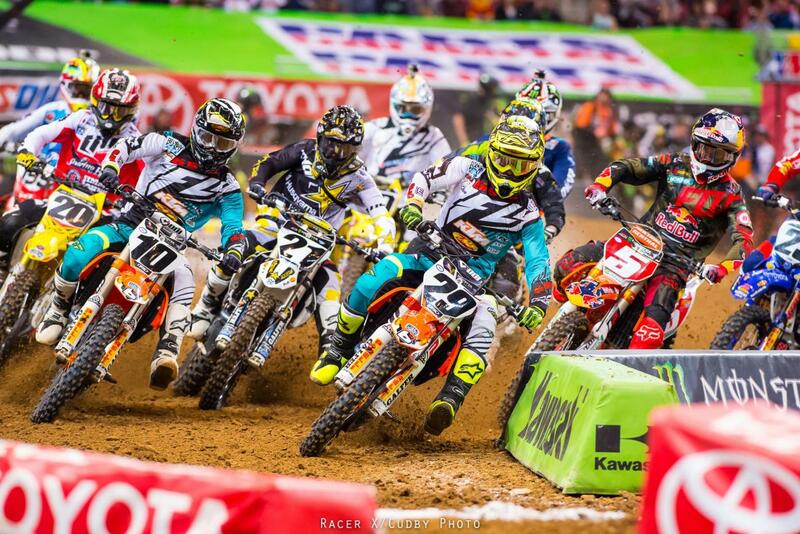 This time he started too far back to even have a shot at Dungey. "I was trying as hard as I could," Tomac said in a GEICO Honda PR. "I had a good battle with Jason there for quite a few laps. I should have made a pass on him earlier, and that kind of blew it for me. That shuffled me back probably five seconds or so. That was make or break to have a sniff at the win." Anderson’s podium was big, since he hadn’t been there since his sensational second place at the opener in Anaheim (behind Ken Roczen. Does that race seem like it was 100 years ago now?). It also came on the heels of his two worst races of the year. “I feel like I could have done this at some of the other races if I just got a start like this,” he said. Seely was fourth, another solid run. He’s fourth in points but just six behind his now-injured teammate Trey Canard, making him a likely candidate to finish third. 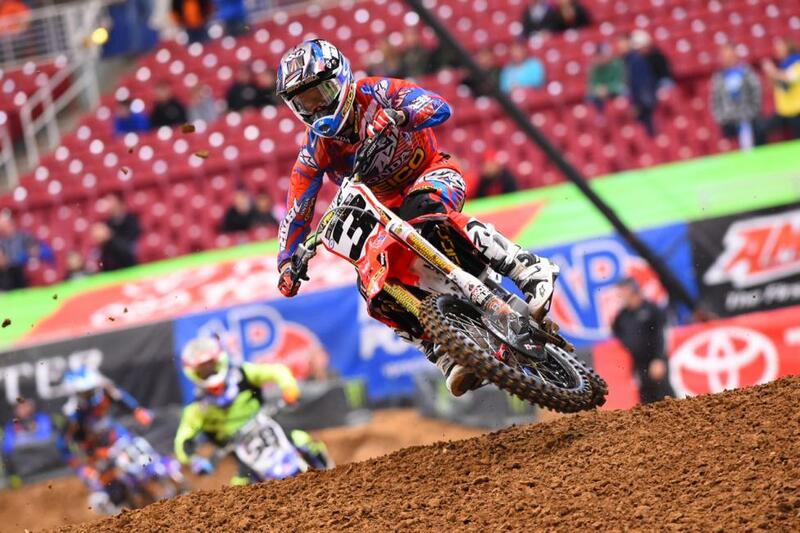 Honda HRC Team Manager Dan Betley says it’s absolutely a big deal if Seely can finish third in his rookie season. Peick ran second early but once again didn’t have twenty laps in him. 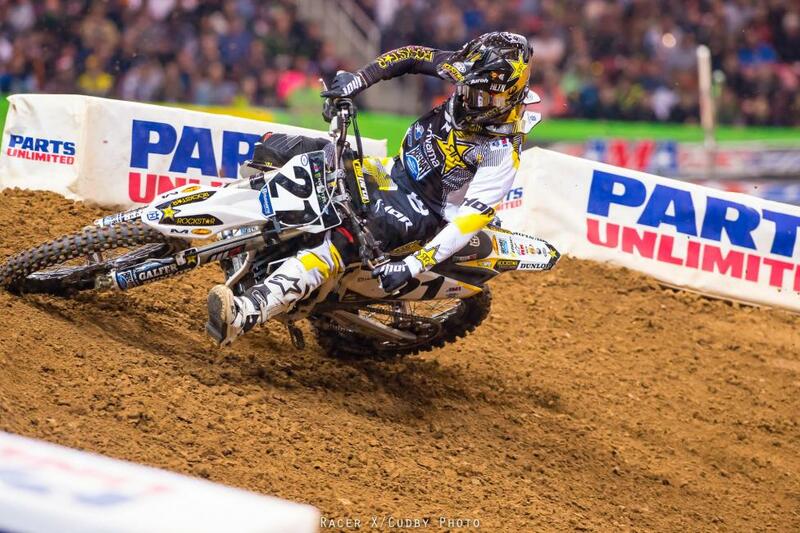 Been a pretty rough year on Peick, injury wise, and he took two more big crashes in practice. One Anderson got him for second, the bottom dropped out and Tomac and Seely quickly went by. He hung tough for fifth, his fourth top five of the season. Josh Grant keeps getting better on the Discount Tire/TwoTwo Motorsports Kawasaki. He even beat the boss this weekend with a sixth. Grant gated pretty well in the main event for the first time this year and rode solid and steady for the spot. He wasn’t as fast as the Tomac/Anderson/Seely/Peick group, or Dungey, but he was best of the rest. Bad starts for Chad Reed and Blake Baggett, they came through the pack together until about the halfway mark. Baggett, who was really sick, seemed to fade a bit and took tenth. Reed kept charging and was able to get Soaring Eagle/Jimmy John’s RCH Suzuki’s Broc Tickle for eighth. Earlier in the race, Tickle was seventh, but Monster Energy Kawasaki’s Davi Millsaps was able to get him for that spot, then Reed went by to push him to ninth. Musquin is just the class of the 250 field, no doubt whatsoever. This time he had a real challenge from Yamalube/Star Yamaha’s Jeremy Martin, who grabbed the holeshot. Then Martin and Musquin scrapped it out on the first lap until Musquin finally secured the lead and pulled away. With a 20-point lead in the standings and one round to go, this title is nearly a lock for the Marv Attack. Martin rode good, but simply wasn’t as fast as the Moose-Can, so he finished second. Martin says he made big changes to his starting technique after working with Ricky Carmichael and his practice bike mechanic this week, and it worked by pulling the holeshot. Joey Savatgy needed one of those starts. He rode well but started a few spots back, and Musquin and Martin were long gone by the time he was third. 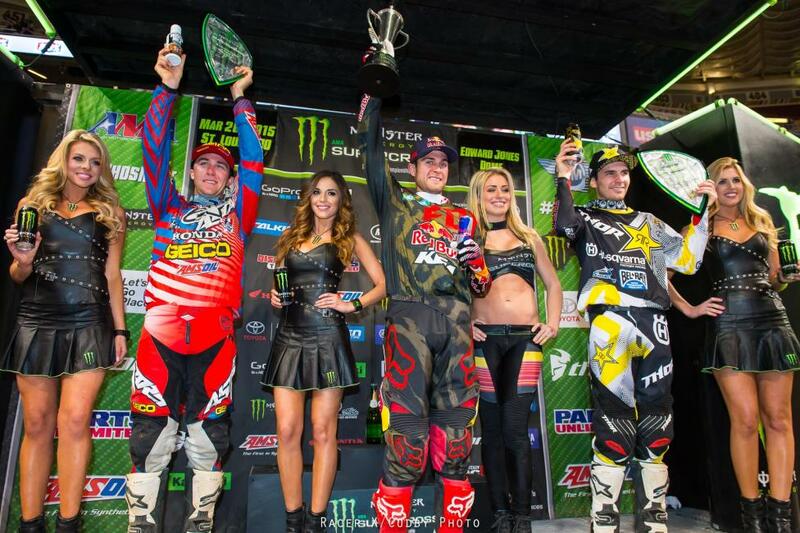 He held on to take a podium for Monster Energy/Pro Circuit Kawasaki. Justin Bogle’s podium streak is over, but he took fourth. Simply put: a bad start. That was it. Bogle was bummed to lose more points to Musquin and said the bad start was on him—he almost went early, had to pull back, and the pack took off. Bogle’s GEICO Honda teammates had rough ones. RJ Hampshire crashed hard in practice, ending his night early. Jordon Smith crashed in a pileup in the main, he came back for 13th. Star’s Anthony Rodriguez is getting the consistency thing down. He finished fifth for the second week in a row. A-Rod told us he feels like this year is more like his rookie year should have been, he was injured coming into last year and was never quite ready. Now he’s learning the tracks and learning to keep it on two wheels, and things are improving rapidly. 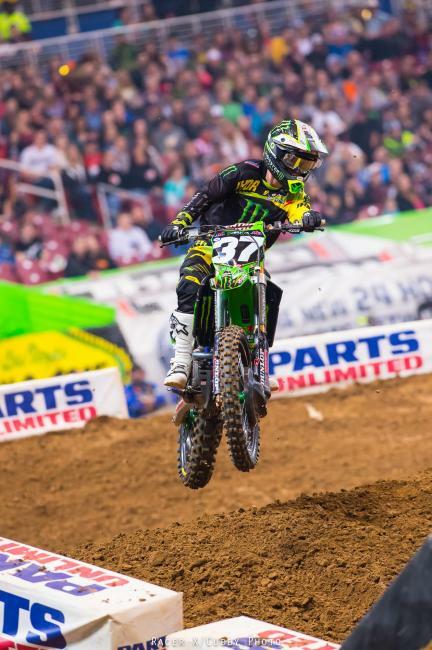 Monster Energy Supercross has reached perhaps its most underrated event of the year, at the Edward Jones Dome in St. Louis. Now, St. Louis in March might not have have the glitz, glamour, prestige (or warmth) of Anaheim or Daytona, but this race has a lot going for it. First the dirt here is always great, probably the best we'll see all year. It's soft and tacky but somehow doesn't rut up the way most of the softer tracks do. It will get rutted, but not "Atlanta in the 90's" rutted, so it's raceable. Second, the crowd here is always big and raucous. The pits here and indoors and packed, too. Folks around here don't get too many races so they show up early and stay late. Maybe it's some combination of those things that have made this one of the better races, historically, as far as action goes. We've seen some crazy ones here, starting with Jeff Emig's snapping of Jeremy McGrath's perfect season bid at the first STLSX in 1996, through a crazy one just two years ago with Ryan Villopoto prevailing over, ahem, a series of red and yellow flags. Oh, and one night Ricky Carmichael and James Stewart both DNFed, and Chad Reed won the race to make up basically 1,000 points in one night. The championship could use such drama right now, as Ryan Dungey is rolling toward a title on his Red Bull KTM. GEICO Honda's Eli Tomac might have figured things out now, but he's 77 points behind Dungey in the standing. It would take St. Louis blues of epic proportions for Tomac to get back in this--although he's going very, very fast. Similarly, Dungey's teammate Marvin Musquin has a 13-point lead on GEICO Honda's Justin Bogle with two 250SX East races to go. Bogle won last week and needs to do it again to keep some level of pressure on. In other news, Rockstar Energy Racing's Jason Anderson is back despite a huge crash last week. He told us this morning he's just sore but otherwise okay. Justin Brayton is in his second race back for BTOSports.com KTM. He says his shoulder gave out after about eight laps last week in Detroit. He said he got up to 15 laps this week at home before he had troubles, so that's a big improvement. Also watch for Cole Seely and Davi Millsaps, who have been making strides as of late. 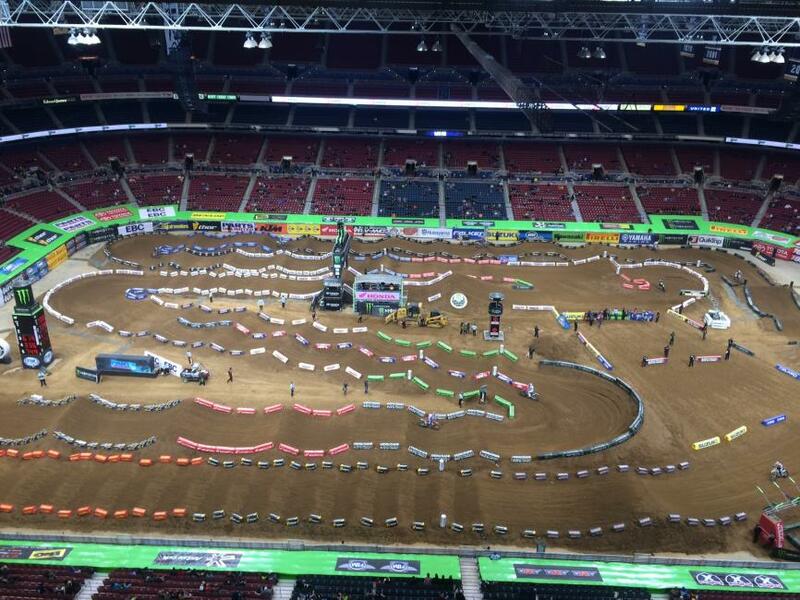 Most years the St. Louis track features huge whoops, but this year they're the least-difficult section on the track. There are some big rhythms, though, and even a split lane that maybe, maybe, just might offer similar speed on both sides, and hence something more than "half of the track will just go unused." You can hook the inside in a corner and go 2-2-3 or go outside and 2-3-2. There's also a big quad here similar to watch Tomac used last weekend in Detroit. He did it a few times in practice here. We also like a super steep, slow double with a bump in front of it. It slows the laptimes down but is much more fun than a wall jump. Stay tuned here for all the action from the STL--will it be another one for this race's storied history? Like we said, stay tuned. Eli Tomac in on fire right now. He carried his speed from Detroit here to the STL, and was experimenting with a variety of jump combos. Watch fellow Honda man Cole Seely, too, who is fluid and fast. Justin Brayton was quick but isn't sure he has 20 laps in him yet (see an update on him below). In the 250s, Justin Bogle kept trying to raise the bar but Marvin Musquin kept matching and exceeding him. It took awhile for Jeremy Martin to finally log a quick lap, but once he did, he was in the hunt. J-Mart needs a rebound here. In the 450s, Tomac and Seely went out and started crushing it early again, immediately going to 1-2, respectively, on the lap charts. You could tell by now the riders had most of the track dialed--the quad Tomac tried in the first session wasn't attempted, it wasn't faster, plus, you can't get jump it and get to the inside of the split lane. And everyone now wants to use the inside/left side of the split. Once again, you throw them a split decision and the team video analysis will tell them the decision is actually quite easy. But just when all seemed set, Ryan Dungey went out and posted a huge time, besting Tomac's mark by a half second. Tomac ran another heater but came up just short of Dungey's mark. Remember, always, with Dunge: he's strong, he's consistent, he's the Diesel, but he's also fast. Also, signs of life from Jason Anderson, who had a rough go of it the last two weekends. He was third, getting ahead of Seely near the end of the session. Seely did try something key, though, in jumping through the whoops. They're going to get rough and rutted tonight and jumping might become the fastest technique. We can tell you though that it did not look easy when Seely tried it--they're going exceptionally fast through them so lining up the perfect landing spot isn't going to be easy. Weston Peick had a rough set of practices, looping out in the first timed session and crashing out of the final one. He somehow still ended up fifth fastest. He should be fine for the night show and the track better hope he's not mad at it. In 250s, Marvin Musquin was the class of the field again. Late in the session rookie RJ Hampshire went down hard, leading to a red flag. He took a ride in the Asterisk Mobile Medic mule, we'll check on his status for the night. When the session resumed, Joey Savatgy busted out a quick one to get to second fastest behind Musquin. Jordon Smith had a good crash in the first session, but came back with a solid 6th quickest here. Meanwhile his teammate RJ Hampshire took a digger and might have to take a trip to the hosital for a check up. Of course he wants to get right back and race immediately, though. Here's Marvin Musquin showing you the international flavor of the series in more ways than one.